Swords, sticks, tea and buns! Yes, it could only be another Bideford Martial Arts Seminar! We had a great time yesterday at the Aikido weapons workshop taught jointly by Senseis Richard Small (Bideford Aikijo) and Huw Collingbourne (Hartland Aikido). Thanks to everyone who came. Our next special event is in September. More news soon. Here's a photo from yesterday's seminar. Aikido weapons seminar, Bideford, North Devon, 27th June. All welcome. 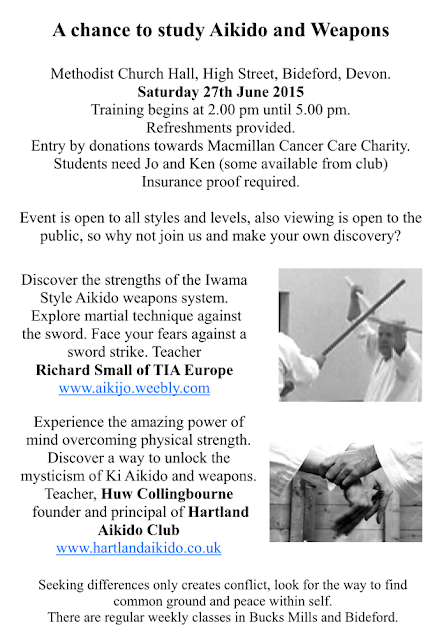 Taught by Senseis Richard Small (Bideford aiki-jo) and Huw Collingbourne (Hartland Aikido). Please bring bokken and jo if you have them.